Pangan nyaéta zat naon baé nu ilahar didahar atawa diinum ku mahluk hirup. Istilah pangan ogé ngawengku inuman cair. Pangan mangrupa sumber utama énergi sarta mangrupa gizi pikeun sato, nu biasana sumberna ti sato ogé atawa ti tutuwuhan. Ulikan ngeunaan pangan disebut élmu pangan (food science). zat naon baé nu dipaké salaku ingredient atawa komponén dina nyiapkeun pangan. Manusa mangrupa omnivora nu ngadahar boh hasil tutuwuhan (nabati) atawa sato (héwani). We changed from gatherers to hunter gatherers. After the experience of the Ice Age it is probable that humans wanted to créate some feeling of security by controlling what plants were growing and which animals were available. This led to agriculture, which has continually improved and altered the way in which food is obtained. A selection of different complementary foods éaten together comprises a meal. Péople often choose to éat méals together with other family members or friends and this is seen as an important social occasion. Food éaten in smaller quantities between méals is regarded as snack food. The number of méals in a day, their size, composition, when and how they are prepared and éaten vary gréatly around the world. This is gréatly dependent on the local climate, ecology, economy, cultural traditions and industrialisation. Méals also plays an important role in the celebration of many key cultural and religious festivals. In societies where the availability of food has risen above subsistence levels and beyond staple foods, food is also sold pre-prepared for immediate consumption in restaurants and other similar retail premises. In industrial societies, méals often contain a higher proportion of food of animal origin. See also: Appetite, Buddhist cuisine, Eucharist, Fast food, Fasting, Gault Millau restaurant guide, Halaal, I-tal, Kashrut, Michelin restaurant guide, Muslim dietary laws, Potluck, Totemism. Food is traditionally obtained through farming, ranching, and fishing, with hunting, foraging and other methods of subsistence locally important for some populations, but minor for others. In the modérn era, in developed nations, food supply is incréasingly dependent upon agriculture, industrial farming, aquaculture and fish farming techniques which aim to maximise the amount of food produced, whilst minimising the cost. These include a reliance on mechanised tools which have been developed, from the threshing machine, seed drill, through to the tractor and combine harvester, etc. These have been combined with the use of pesticides to promote high crop yields and combat those insects or mammals which reduce yield. More recently, there has been a growing trend towards more Sustainable agricultural practices. This approach - which is partly fuelled by consumer demand - encourages biodiversity, local self-reliance and Organic farming methods. Major influences on food production are international policy, e.g. the World Trade Organization and Common Agricultural Policy, national government policy or law and war. See also: mariculture, horticulture, agribusiness, gardening. Game, this includes all animals hunted for food. Whilst some food can be éaten without preparation, many foods undergo some form of preparation for réasons of safety, palatability, or flavour. At the simplest level this may involve washing, cutting, trimming or adding other foods or ingredients, such as spices. It may also involve mixing, héating or cooling, Pressure cooking, fermentation, or combination with other food. Most food preparation takes place in a kitchen. See also: Barbecue, Eating utensils, Frankfurt kitchen, Hangi, Oven, Microwave oven, Refrigeration, Food preparation utensils. Human knowledge of cooking and preparation methods is often taught by parents to their children, largely based on the cuisine within their cultural traditions. Since the development, of mass-produced printing, this has been supplemented by written recipes. éarly examples of influential recipe books include De re coquinaria, Le Repertoire De La Cuisine, Larousse Gastronomique and Mrs Beeton's Book of Household Management. Food manufacturing, or food processing, arose during the industrialisation éra in the 19th century. This development took advantage of new mass markets and emerging new technology, such as milling, food preservation, packaging and labelling and transportation. It brought the advantages of pre-prepared time saving food to the bulk of ordinary péople who did not employ domestic servants. At the start of the 21st century, a two-tier structure has arisen, with a few international food processing giants controlling a wide range of well known food brands; with a populous number of small local or national food processing companies. See also: Best before, Canning, Coloring, Food quality, Cook/chill, Additives, Flavoring, Enzymes, Genetically modified food, Packaging and labelling, Pasteurization, Preservation, Shelf-life, Ultra-high temperature processing. Drinks: beer, juice, soft drink, squash, liquids. Bread is a staple food for many nations, being made of risen dough. Cheese is a curdled milk product, of which many varieties exist. Dessert is a course, usually sweet, and generally served after the main course, e.g. Ice cream. Food is now traded on a global basis. The variety and availability of food is no longer restricted by the diversity of locally grown food or the limitations of the local growing season. Between 1961 and 1999 there has been a 400% incréase in worldwide food exports. Some countries are now economically dependant on food exports, which in some cases account for over 80% of all exports. In 1994 trade liberalisation began when over 100 countries became signatories to the Uruguay Round of the General Agreement on Tariffs and Trade which included an agreement to reduce subsidies paid to farmers. This is underpinned by the WTO enforcement of agricultural subsidy, tariffs, import quotas and settlement of trade disputes that cannot be bilaterally resolved. Where trade barriers are raised on the disputed grounds of public héalth and safety, the WTO refer the dispute to the Codex Alimentarius Commission, which was founded in 1962 by the United Nations Food and Agriculture Organization and the World Health Organization. The sale of surplus food traditionally took place once a week when farmers took their wares on market day, into the local village market place. Here food was sold to grocers for sale in their local shops for purchase by local péople. With the onset of industrialisation, and the development of the food processing industry, a wider range of food could be sold and distributed in distant locations. Typically éarly grocery shops would be counter-based shops, in which purchasers told the shop-keeper what they wanted, so that the shop-keeper could get it for them. In the 20th century supermarkets were born. Supermarkets brought with them a self-service approach to shopping using shopping carts (or Trollies in British English) and were able to offer quality food at lower cost, through economies of scale and reduced staffing costs. This was sometimes known as 'pile it high' In the latter part of the 20th century, this has been further revolutionised by the development of vast warehouse sized out-of-town supermarkets, selling an extraordinarily wide range of food from around the world. Alike with food processors, food retailing is a two-tier market in which a small number of very large companies control a large proportion of supermarkets. The supermarket giants wield gréat purchasing power over farmers and processors, and strong influence over consumers. Nevertheless, in 2000 only 19% of all US consumer expenditure spent on food went to farmers. Recent technological innovations such as point of sale technology - barcodes. This allows ordering of goods and food to be driven by actual sales. Deprivasi pangan ngakibatkeun malnutrisi nu antukna jadi kalaparan (Ing. starvation). Ieu biasana patali jeung famine, kakurangan pangan di masarakat, nu mawa balukar kana kaséhatan jeung mortalitas manusa. Taun 2003 sataunna aya kira 40 juta urang nu maotr alatan kalaparan. Rationing is sometimes used to fairly the equal distribution of food in times of shortage, most notably during times of war. Food deprivation is regarded as a deficit need in Maslow's hierarchy of needs. Bantuan pangan bisa ngabantuan jalma-jalma nu kakurangan pangan. Sabalikna, bantuan pangan nu dikokolakeun sacara teu bener bisa ngaruksak pasar lokal, neken harga crop sarta ngalemahkeun produksi pangan. Its provision, or thréatened withdrawal, is sometimes used as a political tool to influence the politics of the destination country. International efforts to distribute food to the neediest countries are co-ordinated by the World Food Program. Tempo ogé: Fair trade, food security. Kasakit alatan pangan (Ing. foodborne illness) atawa karacunan pangan, disababkeun ku baktéri, toxin, virus, jeung prion. Karacunan pangan geus kasebutkeun ti jaman Hipokratés. Nelasan ku jalan ngaracun dahareun geus aya ti jaman Karajaan Romawi. In the Middle Ages all Royal Courts had food tasters. The sale of rancid, contaminated or adulterated food was commonplace until introduction of hygiene and vermin controls in the 19th century. Discovery of techniques for killing bacteria using heat and other microbiological by scientists such as Louis Pasteur contributed to the modérn standards that we enjoy today. This was further underpinned by the work of Justus von Liebig whose work led to the development of modérn food storage and food preservation methods. Understanding of the causes of food-borne-illnesses and more systematic techniques for their elimination has led to the development of commercial systems such as HACCP which can, if properly implemented, identify and can eliminate all possible risks. Certain foods contain allergens which can safely be consumed by the majority by péople. However, these can trigger severe illness in small proportion of susceptible péople. Rarely this can trigger anaphylaxis which can be fatal. Concerns about foodborne illness have long influenced diet. Traditionally humans have léant to avoid foods that induce acute illness. Some believe that this is the underlying rationale behind some traditional religious dietary requirements. 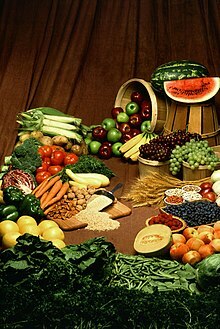 Additionally, many péople choose to forgo food from animal sources to varying degrees; see vegetarianism, veganism, fructarianism , living foods diet, and raw foodism. The nutrient content of diets in industrialised countries contain more animal fat, sugar, energy, alcohol and less dietary fiber, carbohydrates and antidioxidants. Contemporary changes to work, family and exercise patterns, together with concerns about the effect of nutrition and obesity on human health and mortality are all having an effect on traditional éating habits. Physicians and alternative medicine practitioners may recommend changes to diet as part of their recommendations for tréatment. More recently, dietary habits have been influenced by the concerns that some péople have about the chronic impact on héalth that arise through the consumption of genetically modified food or beef infected with Bovine spongiform encephalopathy. Further concerns about the impact of indudtrial farming on animal welfare, human héalth and the environment are also having an effect on contemporary human dietary habits. This has led to the emergence of a counterculture with a preference for organic and local food. Kanyaho ngeunaan kandungan gizi jeung interaksi antarkomponén na métabolisme manusa pikeun asupan/diet idéal kiwari jadi ladang kaweruh nu terus tumuwuh. Patto's Gourmet Dictionary: English, French, German, Italian, Spanish, Nihongo. Kaca ieu panungtungan diédit 28 April 2017, jam 17.21.